When we go for camping, surely we have to adjust ourselves with the nature. Unlike our home, when we go for camping the gas stove probably is not always available. You have to build a fire-place for any cooking purpose. Managing Cooking Sites In Camp can improve your experience significantly. 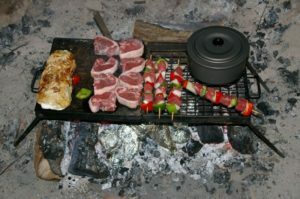 Find the tips below on how to manage to cook or bake when you go for camping. In the fall, when there is a tang in the air and the trees begin to shed their leaves, there is nothing so satisfying as a pot of hot soup or tea cooked over an open fire, with the unavoidable taste of wood smoke and the usually unwanted addition of pine needles. You can invent and construct your stove on the spot. The type you build depends upon the circumstances and the available materials. Four possibilities are shown on the next page. But whatever kind of fire you use, there are some important precautions to take. Forest rangers and nature lovers do not like to see careless people building fires in the woods. And not without reason. Fires incompletely extinguished or sprays of sparks left unwatched have caused numerous, often devastating forest fires. You should build your fire only in the middle of a clearing, in a pit, or on a stony spot. There should be nothing that can burn within 8 to 10 feet all around the fire site. Trees or bushes within this distance from the fire would be damaged by the heat. You must completely extinguish the fire afterwards. It certainly is not too much for you to get some water for this from a nearby brook. If you merely want to stamp the fire out, at least leave yourself enough time for the job it is really not so easy or fast. In addition, you are likely to burn your shoe soles doing this, although you may not notice it until later. Never scatter the fire in all directions so that the coals fly under leaves and are hidden from you somewhere. They keep on glowing. At home, before you set off for your camping grounds, you can make dough with a teaspoonful of baking powder, about six ounces of flour, a pinch of salt, and some water or milk. Knead the mixture into tough dough and pack it in a clean handkerchief or a can when you are ready to go. While your fire is building up the strong heat necessary for baking, cut two forked branches and a straight green hazel or birch stick. Set the branches at each end of the fire. Then make a long roll out of the dough, somewhat thicker than your thumb, and wrap it around the green stick in a spiral, keeping the individual turns at a little distance from each other. The dough will rise while it is baking, and the twists should not bake together. Lay the stick across the forked branches, and turn the spit frequently. The bread is done when you can insert a smooth bit of wood and pull it out dry. If you want to be even more like a woodsman, and if your camp site has fresh running water, you can mix the ingredients at home without any liquid, and put the mixture into a paper or plastic bag. Then, when you are out at the site, you can add the water and cook your bread on a flat stone.